If you’re a new follower you might be wondering where I am and why I’m not posting here. Well, good news because I am actively posting on both of my current blogs! Over at [title of blog], I post about photography, books, faith, and more. I post here every Sunday! Or, if you want to see what my dolls are up to, head on over to Reverie Dolls! I post mostly photography and stories, with something new every Tuesday! These aren’t on WordPress, but it’s easy to follow a Blogger blog with your WordPress account. I even made a tutorial on it here. Lately I’ve noticed that this blog has gotten a lot of followers! Thank you so so much to those who have followed this blog! I just want to let you know that I actually don’t post on here anymore. I ran out of space, so I moved to Blogger. I still make the same types of posts, but at http://victorialsmithauthor.blogspot.com/. If you want to visit me there, I am posting actively. If you don’t know how to follow a Blogger blog with your WordPress account, I did a post on that here. Again, thank you so so much for following this blog and I hope you visit me at my active location!! I am actively posting on my new blog, so don’t miss out on the fun! Even if you don’t have a Blogger account, you can still follow with your WordPress account or with your email. See my post here, that has instructions for how to do this! This week at my new blog location I am doing 4th of July craft posts every day with a final photoshoot incorporating all the crafts on the 4th! The posts will only be at my new blog location, I just wanted to let ya’ll know so you don’t miss it! Also, if you are wondering how to follow my Blogger blog (or another blog) using a WordPress account, I did a tutorial post on the easy process here. I wanted to let you know that my blog is changing locations. I won’t be posting here anymore, because I have run out of storage for uploading pics. I will continue posting about my Etsy shop, crafts, doll photo shoots, and other stuff I normally post about, but just at a different location. This blog will still remain available for the browsing of previous posts. Here is the new link! I have already posted a fun photo shoot there today! Thank you for supporting, following, liking, and commenting on this blog for the past year! I would love it if you would follow me to my new blog, I’ve got a lot of fun posts coming! Today I listed some cute leopard print active wear leggings! See them here! Thank you for over 9,000 views here on my blog! Also, the free pattern on Pixie Faire today for Freebie Friday (one day only!) is the very cute Cut Off Shorts pattern! Click here to hop over to my Etsy shop to see the patriotic new listing for today! I have been posting about dolls for a year! 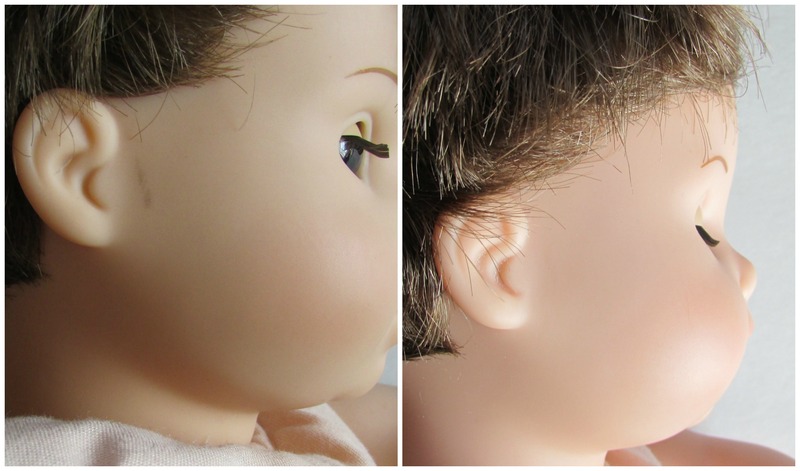 I made my first blog post about American Girl dolls on April 27, 2014. You can see it here. This year I have acquired a few new dolls. I have also learned a lot! I started out hand stitching everything. 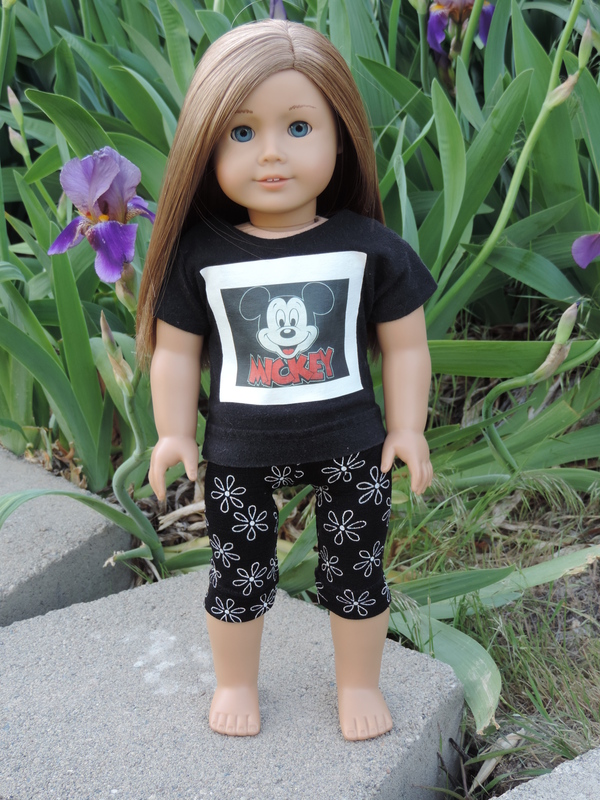 In September of 2014, I got a sewing machine and learned how to use it to create fun clothes for my dolls. Recently in March I decided to not only create fun clothes for my dolls, but to offer the clothes to others too through my Etsy shop! By doing research, looking at other blogs and Etsy shops, I have also learned about doll photography and photography in general. I put some clothes on my AG dolls that I made around this time last year and took some pictures. All of the items are upcycled and hand-sewn. The Mickey t-shirt is the tee made in this post with a photo iron on transfer on the front. The leggings can be read about here. 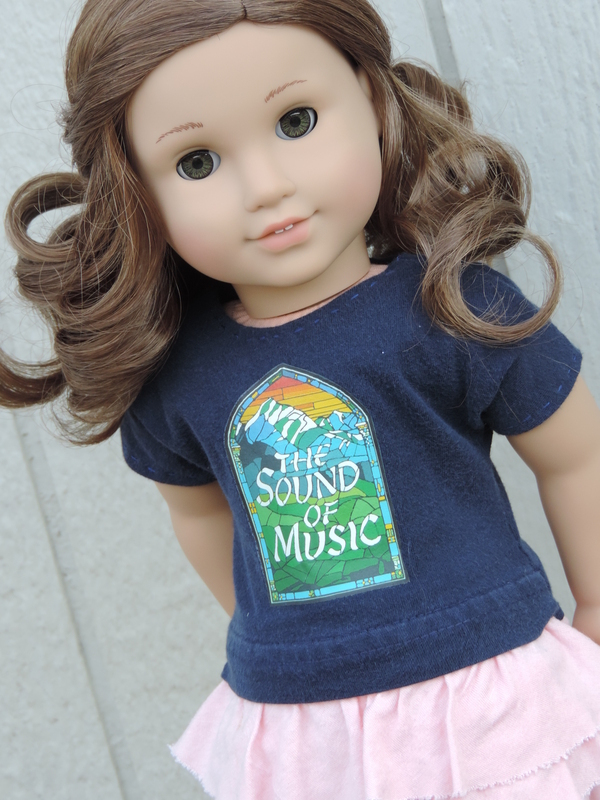 The Sound of Music t-shirt post is here. The skirt I made a while before I posted about it here. I have had a great time blogging, reading other doll blogs, sewing, crafting and photographing my dolls this year! My dolls needed a little tidying up for spring! They are all in good condition, but had minor marks, blemishes, etc. On the American Girl website here, it suggests using baking soda to clean doll skin. 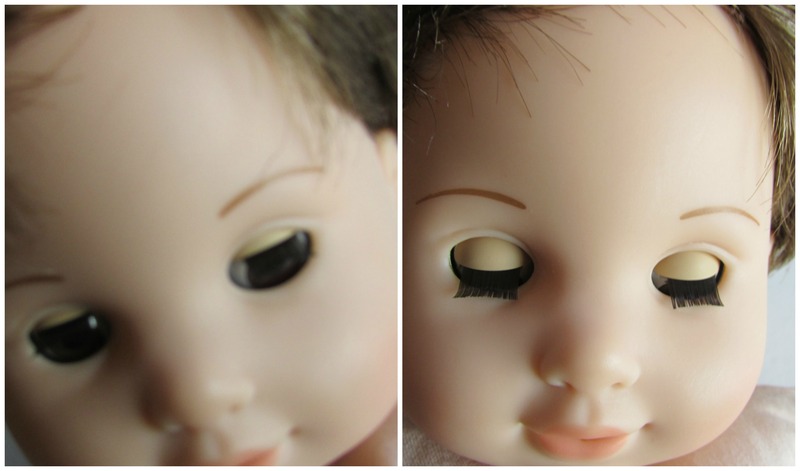 I took before and after pictures to show my experience with using the baking soda to clean the vinyl on my dolls. 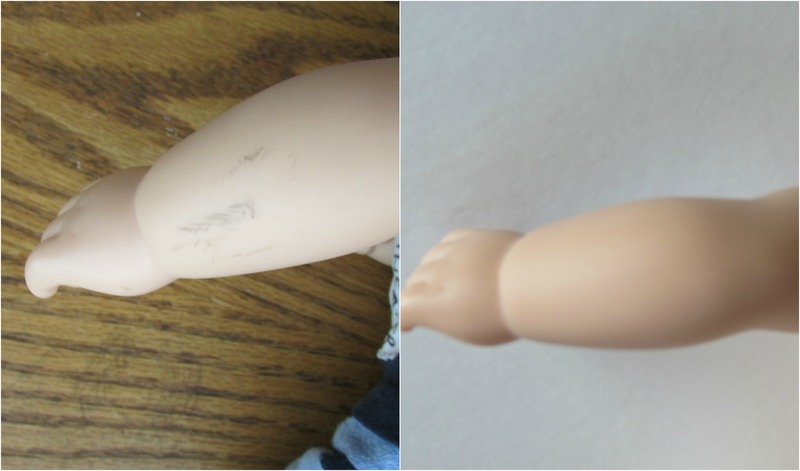 Right arm: My Kidz and Cats doll had a few white marks on her right arm. I was able to significantly lighten them. 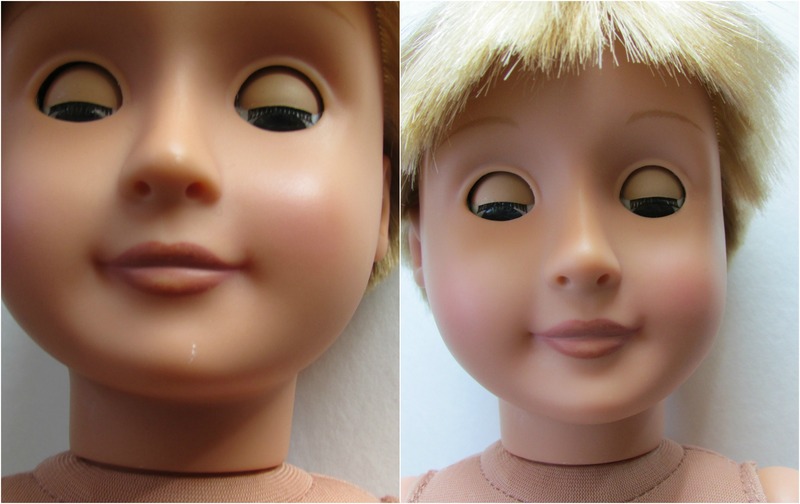 My custom Our Generation boy doll had a small white mark on his chin, as well as an even smaller one on his nose. Both are now gone: His left leg had two small white marks, now significantly lightened. My other bitty twin had light black scuff marks on his forehead, which are difficult to see in the picture. Another dark mark by his ear was significantly lightened. His right arm had a small green mark. The baking soda made it less noticeable.